Drums thumped and Aztec dancers moved to the rhythm of a beat. Fists punched skyward and purposeful chants filled the air. The throng of people walked briskly from Boyle Heights on the way to Downtown LA. The group was protesting a potential prison being built in its neighborhood. mark! Lopez M.A. ’15 (Chicana/Chicano Studies) was young at the time — so young that he was pushed in a stroller during the protest. It’s his first memory of a group of people coming together to fight for themselves. More than 20 years later, Lopez would continue to find himself in the struggle. Through community organizing, protests and gathering support of government officials, the community rid the neighborhood of battery recycler Exide Technologies’ plant in Vernon. For decades, the plant emitted toxic pollutants, most notably lead, into the air, soil, and water. Lead has been found to damage the brain, kidneys, liver, and other organs. According to the Los Angeles County Health Agency, children under 6 years old and pregnant women are at a higher risk for lead poisoning. Thousands of homes in East LA and Southeast LA were affected by the emissions, with Lopez saying more than 100,000 people could have been harmed. 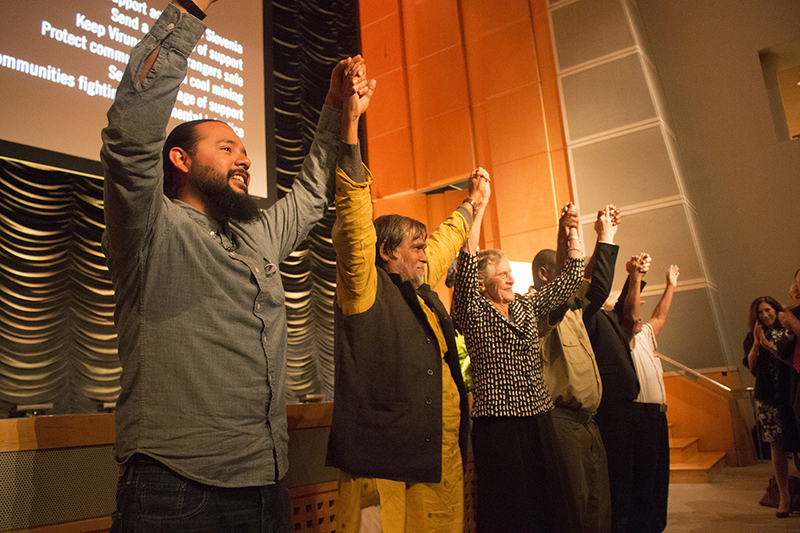 For his work over the years, especially with the East Yard Communities for Environmental Justice (EYCEJ) team, Lopez in April received The Goldman Environmental Prize — touted as the world’s largest award honoring grassroots environmental activists. Six people are honored annually — one each from six continental regions: Africa, Asia, Europe, Islands & Island Nations including Australia, North America, and South & Central America. Much of what shaped Lopez was a family dedicated to righting wrongs. But along the path, his years at CSUN helped elevate his thoughts and actions further. Lopez’s roots in activism run deep into the soil of East LA. His grandmother Juana Beatríz Gutiérrez is an iconic figure in the area, having fought with her husband Ricardo for social and environmental justice for decades. She is a co-founder of the groundbreaking Mothers of East LA activism group that helped derail plans for a prison, toxic waste incinerator and oil pipeline in the East LA area. Gutiérrez’s Mothers of East Los Angeles Collection is housed in CSUN’s Oviatt Library. Lopez’s mother, Elsa, continued the tradition and was active in the Mothers of East LA. In the mid-1990s, Lopez’s mother and grandmother toured the Exide site, and it elevated their worry about the dangers of lead to the community. Lopez remembers being 10 years old and knocking on doors to inform the neighborhood about the long-term effects of exposure to lead. He was a senior in high school when he organized his first protest — a walkout to protest the war in Iraq. He said nearly half of the school’s students participated in the walkout, though he and a friend were the only students not to run back into the school when threatened with expulsion. After high school he earned a degree in environmental studies from UC Santa Cruz, but he desired further education to contextualize what the learned through the Chicana/Chicano Studies lenses. “Chicana/Chicano Studies at CSUN is the premier program and has the largest faculty, the most diverse faculty, the most course offerings, so I was like, this is the place I need to be,” Lopez said. Lopez began attending CSUN in 2008. It was during this year that pressure began to mount considerably for Exide. Air quality officials ordered the company to cut production levels in half. However, Exide, despite being fined numerous times for health violations, remained in operation. In the spring of 2014, elevated levels of lead were found in the soil of homes and a preschool near the plant. Finally, in 2015, Exide agreed to permanently close the plant to avoid criminal charges. The EYCEJ team continued to apply pressure to state officials to accelerate cleanup by mobilizing community residents to lobby legislators in Sacramento. Lopez and other activists were critical of the governor’s office for what they perceived as slow response to Exide in comparison to the action taken to plug the Porter Ranch gas leak (Gov. Jerry Brown declared a state of emergency 2 ½ months after the leak was discovered). Lopez, as many community members, believes the foundation of the Exide issue is race. Because East LA is a predominantly Latino community with less affluence than other Los Angeles communities, their example being Porter Ranch, state action was largely absent in their neighborhood. In April 2016, Gov. Brown signed legislation authorizing $176.6 million for cleanup. EYCEJ continues to fight for more. They want to push the area of testing and cleanup beyond what was determined to be the radius affected by Exide — from 1.7 miles to 4.5 miles. Lopez lives about 2 ½ miles from the plant and says he has elevated levels of lead there. He is raising a family with two young daughters, so it’s very personal to him. Lopez cited numerous studies that have linked high exposure to lead to violence and low educational attainment. Lopez’s passion and work led to his recognition. The Goldman Award has also been referred to as the “Green Nobel Prize.” Lopez said it’s bigger than him.